December contents: A soiled planet?....There is something positive each of us can do right now to restore soil ..... Making compost isn't rocket science!.... Is there much to do outside now? ..... Don't walk on wet soil - or dig it!..... Make a good cropping plan now .....Don't forget to have tunnel-tape at the ready! Winter Poultry Tips. In the picture above taken over 30 years ago, I'm explaining to a group how to re-build soil fertility using organic methods. They were some of my organic box scheme customers from the early 1980s and also members of our local Fingal Green Party - who included our future Green Minister for Horticulture Trevor Sargent - a keen organic gardener with whom I was honoured to be co-founder of the Fingal Greens. A day full of hope! I hope you'll forgive that pun but our forbears had far more respect for the soil than we have today. Researching methods of restoring soil to fertility has naturally always been one of my pet subjects as I started here 37 years ago on the most appallingly degraded and lifeless soil, polluted by agrichemicals. Many people take soil for granted and think of it as just so much 'dirt' - something which simply anchors crops while we pour on the chemicals! But the more chemicals we pollute soil with the less it works as Nature designed it to, and it's now increasingly unable to regulate the climate properly, by absorbing and storing atmospheric carbon - which is one of the jobs it evolved to do. Evolved - some might say? Yes - evolved - because soil is actually a living, breathing community of organisms all working together as they have done since life began. It's not just do much lifeless mineral dust under our feet! Some scientists decided back in the mid 20th century that chemicals were a better and more profitable (for them!) way of growing our food than the way Nature has evolved to over countless millennia! How wrong they were when you look at the amount of ill-health, destruction of biodiversity and climate change which those carbon-releasing farming methods have caused. You can't grow healthy food for humans, farm animals or biodiversity if you don't have a healthy living soil to start with - as I said at the beginning of this month's polytunnel diary. As I'd been invited to talk about soil at the recent launch of the European 'People4Soil' campaign at our National Botanic Gardens - two years ago, *I was looking back through my treasured collection of old Soil Association mags which I was given by some kind friends many years ago. I was looking for some fresh inspiration in order to motivate people to value soil more highly. The collection starts from the very first ones back in the 1930's. So many people all around the world were warning even then of the dire consequences of using synthetic pesticides and other man made chemicals - but they weren't heeded. Of course - there's far more money to be made out of patenting chemicals than there is out of encouraging Nature! Multinationals can't make massive profits from that! So farmers and gardeners trust in Nature was deliberately undermined and they were encouraged to believe that it wasn't possible to grow crops without them! The health of the planet's soils has declined just as sharply as the profits of the multinationals have risen - the health of our crops has also declined and there is now the biggest epidemic of NCDs - or non-communicable - or 'lifestyle-disease' diseases - as diabetes, cancer, dementia are known - in human history. The consequences of this greed and blind ignorance are now coming back to haunt us in the shape of antibiotic resistance, an exponential rise in the incidence so called 'modern lifestyle diseases' and also in the global destruction of soils to the point where a great deal of land is no longer capable of growing vital crops, and soils are devoid of any humus and carbon to hold them together, are washing away into rivers and creating 'dead zones' in the seas - where the nutrients running off from farmland eventually make their way to the coast killing off marine life. In some parts of the world, it would take nature many hundreds of years to restore soils to proper fertility again. All this in a world with a rapidly increasing population! Even on our country roads here in Ireland we can see soil pouring out of gateways onto roads after heavy rains - and flooding in winter is now a regular occurrence. There's no humus or carbon left in that soil to hold it together any more or give it any resilience against extremes of climate - and this is something which will be happening more in the future with climate change. That's because over the last 40 or 50 years in particular, farmers have been literally mining all of the carbon and humus that has built up over millennia - pouring chemicals onto it and putting nothing back in the form of composts and manures to hold thw sopil together. The great Sir David Attenborough said "Anyone who believes in indefinite growth on a physically finite planet is either mad or an economist!" - Or both perhaps? People who think that peak oil is the major problem facing us are so wrong. Peak soil is our real problem! We could do without oil - but we can't survive without the soil, despite what some proponents of hydroponics would have you believe. - and neither can the planet! A healthy, living soil doesn't just grow things - it traps and sequesters huge quantities of carbon - more than anything else on the planet. An unhealthy, dying soil that has been destroyed by chemicals does exactly the opposite, releasing carbon rapidly into the atmosphere as it degrades - adding massively to climate change. Most people don't appreciate the complex biological processes that are going on right under their feet! The health of the soil that feeds us is vital to our own health, as well as the health of the planet. Hydroponics can't grow healthy crops - feeding plants with the chemicals or even organic nutrients that WE think they need can never produce the same healthy plants that nature does. There's an awful lot going on in soil that despite all our modern technology - we still haven't actually discovered yet. We are only just beginning to understand that there is a hugely complex web of billions of organisms in a healthy soil which are all dependent on each other in able to be able to do their job. The plants then in turn depend on this web of life to produce the compounds to keep them healthy - the soil is quite literally their immune system. We need to understand this interdependent food web better fast - if we are to to restore resilience to our soils! We can each make a change to our own small little corner of the planet - indeed we each have a responsibility to do so - every one of us. It's vital to do it now - not in 10 or 20 years time when it affects us personally in richer countries - because by then it will be far too late! Our little bit may not seem much in the greater scheme of things - but it can make a difference if we all do something. One of he ways we can do this is by growing as much of our own food as possible - in a low carbon, non-polluting, peat-free and organic way that enhances - not destroys nature! If we can't grow food ourselves - then we should try to support regenerative organic agriculture as much as we can by buying organic if possible. Organic is the only truly sustainable agriculture - the way that Nature does it! The soil gave us life - and if we destroy it we no know that there is no hope of our children and their descendants living on a planet which supports life as we now know it - it's that serious! Climate change is like a snowball rolling downhill - the more energy it gathers the faster it goes. The outcome of the recent talks in Poland were almost a one day wonder on social media - then the general focus moved back again to Brexit! I really despair sometimes. Despite the warnings of such respected commentators as Dir David Attenborough, so many people are still not taking it seriously! Surely anyone who has children must think about their future and worry the mess we're leaving for them to clear up - unless they're entirely selfish? As the famous quote says - "We do not inherit the earth - we borrow it from our children"............I would say "We borrowed the soil from our children, we were profligate with it's riches and we have squandered their inheritance!" But we can rebuild and restore that inheritance by using organic, soil carbon regenerating methods. Using compost, green manures, cover crops, mulching and not digging deeply which disturbs fragile fungal systems are all ways we can rebuild soil. By using compost I don't mean dumping tons of manure or compost and leaving it open to the weather either - that just runs off, pollutes groundwater and emits greenhouse gases into the atmosphere as I mentioned last month. Biochar is an interesting and increasingly popular way to restore carbon to soil and hold on to fertility too. Biochar is basically charcoal that has been made by burning wood by a method known as pyrolysis - or in other words in the absence of oxygen, just as the woodsmen charcoal makers still do. This was used by some Amazonian Indian civilisations in the past to make their soil more fertile and help it to hold onto nutrients. I've always used shredded woody prunings and wood chips to introduce more carbon and humus into my compost heap, ever since I've been gardening and it's always worked extremely well. Next year I'm going to have a shot at making my own biochar too - from the biomass willows which I planted 25 years ago in the 'wet woodland' habitat at the bottom of the wildlife meadow. I also have some Miscanthus or elephant grass which I'm planting around the hen runs to use up the nitrogen in their nitrogen-rich droppings. It's another of the plants which is recommended for making biochar - but basically any woody prunings will do. Making compost isn't rocket science! When I'm giving talks, compost is the one thing people seem to get really hung up about - and it's really easy - nature does it without any help from us quite naturally! But just as with everything else - Nature does it more slowly. It's only when us impatient humans intervene and want instant results that problems always seem to happen! Tidy up any dead or diseased plant material and bury it well in the compost heap. The exception to this is potatoes. Never put any 'blighty' potatoes or foliage in there as I saw recommended recently - unless your heap is huge and gets hot enough to fry eggs! The other no-no is any dodgy onion peelings which could possibly carry onion white rot. As always when making compost - make sure there's a good mix of wet and dry, green and brown, soft and fibrous material, cover it to prevent the rain getting in, and you'll be OK. it's mostly common sense, so if you're new to doing it, don't get in a state and think it has to be perfect - just do it! And cover it! Nature will do the rest. If you just throw any plant remains in a heap somewhere eventually they would rot down, but if you organise it a bit better, by putting it in a bin or a neat heap and covering it to keep the weather out - it will happen a lot more quickly and you won't lose all the nutrients out of it. It's a bit like making a cake really - and the results smell almost as delicious! At the Botanic Gardens last year got a lot of laughs when I admitted to being a serial compost sniffer! Seriously though - there are microorganisms in healthy soils and good compost that can actually relieve stress when inhaled - that's one of the reasons why gardening and being in nature are so relaxing. So go ahead and try it - happy sniffing!! Making a new compost bin is a great job for a cold day in winter. If you've got enough room, pallets secured with posts at each corner are just the job to make a heap about 1m square, or even bigger if possible, which is a good size to get it to heat up really well in order to kill weed seeds etc. It also keeps it relatively tidy too. The bigger the heap, the better it heats - but you do need to get quite a lot of material together to start it. You'll need two or preferably three compartments, one for adding new material to as you have it, which you then turn upside down into the next one to mix in air and continue rotting, and one for made compost which has been turned in there as it is ready for use. In practice though, you can get away with two, taking out the best from the second heap as you turn it. That keeps everything neat and tidy. I grow comfrey plants beside my compost heaps, they take up any nutrients which may leach out into the surrounding soil, I also compost all the dog poo in a separate heap of it's own, away from that area, which is then used to fertilise the comfrey. The comfrey I grow is Bocking 14, (a high-potash, non-seeding strain developed by the late great Lawrence Hills decades ago) it's used to make a high potash liquid feed, as a weed smothering mulch, minced up as a treat for the worm bin or just put on the compost heap. Nettles also grow there, without any help, as they do! They are mixed with the comfrey for the liquid feed or cut before they flower to put on the heaps as a great activator, as they are high in nitrogen too. Absolutely nothing should be wasted! A very funny incident, when I happened to be spending a few days working in the HDRA advisory department, many years ago, picking out slides for lectures and an organic roadshow that I was setting up at the time. A chap rang up the advisers to ask if he should put his tea leaves on the compost heap. He was extremely worried as he'd heard that they possibly contained traces of aluminium!....The reply was "well you're drinking it aren't you.....?!"!! After he'd rung off the whole place collapsed into general mirth!! A little common sense never goes astray!! 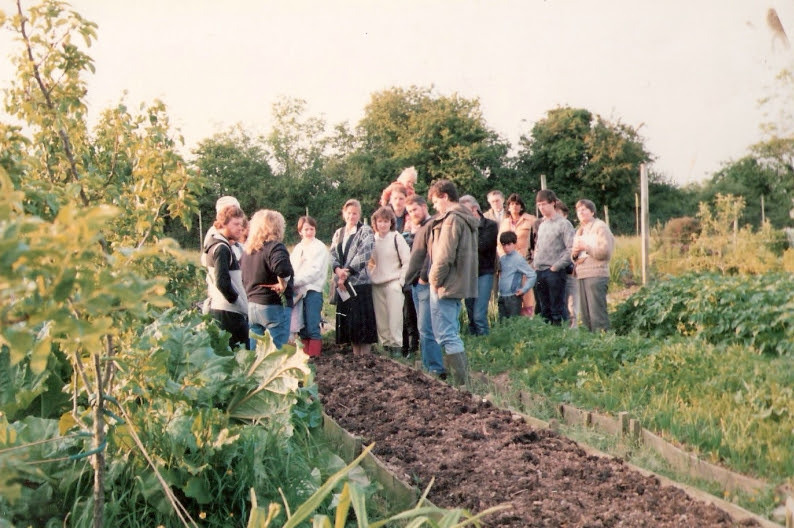 They were such a great bunch at the HDRA (now Garden Organic), always helpful, cheerful and encouraging and extremely supportive of our efforts to promote organics here in Ireland in the early days. The late Lawrence Hills came over here in the early 1980's, and made a terrific impression on me and all who met him. He was such a powerhouse of energy, enthusiasm and ideas you could almost have run the National Grid off him! Alan and Jackie Gear were also both tremendously helpful and supportive too - and are greatly missed now on the UK organic scene since their retirement. In some ways I feel the organic gardening scene has run out of steam just a little lately - although there are a great many people trying to do good work. Is there much to do outside now? Although December is a quiet time in terms of sowing and planting there's still plenty of things you can be getting on with which will give you a real head start next year. If you want to warm up and work off some of that Christmas pud. (or other excesses!) 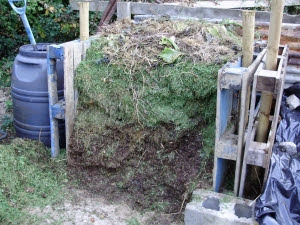 turning the compost heap and mixing the contents is great calorie-burning activity! If it's not very well broken down, you can add in some fresh poultry manure or other high nitrogen additions (certain ones spring to mind when thinking of Christmas excesses that I won't mention here!) this really gets it heating up again, which is just what you want. Make sure compost heaps are securely covered with something waterproof to stop possible leaching and nutrient loss, and adding another insulating layer to help keep any warmth in is also a good idea. When the heaps have started to cool a bit, the worms will begin working slowly in them if they're not too cold. Just as in November, don't dig ground and leave it uncovered because of possible nutrient leaching and carbon loss. I'm astonished at the number of 'experts' who still tell you to smother all vacant ground with manure or compost, or dig it in and just leave it open to the elements for the winter! It appears to me that a lot of their advice is just taken straight out of old fashioned, out of date books! Never leave empty ground uncovered all winter. A cover crop or green manure cover is best - but if I need a patch early in spring then on my heavy clay I find covering securely with black plastic or something else waterproof and light excluding to stop weed seeds germinating and stop nutrients leaching works well. Then I just uncover it occasionally on fine days to let the birds deal with any pests, slug eggs etc. they can find. The robins in the garden will follow me and watch - flying down the minute I uncover anything, to be first to grab the goodies! If the bed is for early carrots or other fine seed, then in mid January I replace the cover with a clear plastic cover (usually cut from left over tunnel polythene) this warms up the soil and encourages any lurking weed seeds near the surface to germinate. I then uncover just before sowing in Feb. or March and pass over it lightly with the flame weeder, this kills off any weed seedlings on the surface and creates a clean, so called 'stale' seedbed to sow the carrots into. That gives them a head start without competition and weedy hiding places for slugs! It also barbecues slugs nicely - nasty person! If you haven't done so already (see Nov.) - it helps so much when you're ordering seeds - especially if like me, you tend to get carried away and order far too much! The catalogues all look so tempting. And as I advised in the 'What to Sow now' section - do get your seeds ordered before the good varieties run out. Stick to varieties you know will do well in your garden, trying one or two new ones each year. If you're new to gardening - ask an experienced gardening neighbour - this is where local GIY or other gardening groups are useful. They may have meetings once a month in many areas where you can meet other local gardeners. This is really helpful as climates and soils differ so much all over Ireland and the UK. When I'm ordering seeds, I like to try one a few new varieties each year, because a lot of research is being carried out into disease resistance etc., which is all good news for organic growing. The one thing many proponents of only growing so-called 'Heritage' varieties seem to forget is - that our climate is changing and we need plant breeding to continue producing suitable varieties for the future - as well as retaining the best from the past - if we want to be self-sufficient in food in the future. Order your seed potatoes as soon as you can if you haven't already. At the end of the month or during January you could plant a few 'extra-earlies' in pots to be ready at Easter if you've got your own sprouted seed saved from your earlies this year. You can still plant garlic in pots, if the soil is wet, to plant out later. I then needed a lot of topsoil, which was a major problem. I am gradually replacing all the raised beds in the kitchen garden with a new higher edging, they were originally minimum-dug 'deep beds' 30 years ago, but now need to be a lot higher as my back needs to bend a lot less! I priced topsoil on the internet a few years ago - at anything between 99-150 euros a ton it would have cost around 6,500 euros, added to which, it would most definitely not be organic (although they'd probably tell you anything - a bit like horse dealers!) Then I had a brainwave! I could get my own topsoil by digging out the large wildlife pond I had always wanted, in the wet spot at the bottom of the field which was full of brambles and scrub. In June 2010 - my local builder, who loves to do anything a bit different, came along with his digger and I stood waving a flag (no this way...that way) and feeling very powerful! I then lined it with old polytunnel covers I had been hoarding for years, waiting for an opportunity to recycle them. The whole thing cost roughly 1/6th of what the topsoil alone would have cost, gave me a very neat solution to three different problems - and endless joy! I've since spent many happy hours watching dragonflies and bats hunting over the pond, and even watched as a female dragonfly laid her eggs on the edge. They moved in incredibly quickly, within 3 days of it filling with rainwater, probably because I have a smaller pond elsewhere in the garden and it seemed a much better and bigger 'des-res.'! It's such a peaceful place to sit on a summer evening - listening to the breeze gently rustling the surrounding birch and willow trees. But most importantly - don't forget you can grow in almost anything - as long as it will hold soil or compost deep enough for roots and has some drainage. Don't wait until you have the perfect garden - start in a container or two now. Even a broken bucket could grow a patch of salad leaves - and they're far less likely to be eaten by slugs when up out of reach a bit. So just do it - and worry about any cosmetic issues later! Picking some of your own fresh and healthy food is the important thing - however small your plot or pot! A friend of mine is now partially disabled and her son, who works in the building trade, has collected some old baths that were being thrown out of buildings that were being re-furbished and they make fantastic raised beds in her small garden. Next year she' planning to put low fencing around them and grow flowers in from of them! Where there's a will there's a way as the old saying goes! Don't walk on wet soil - or dig it! The ground outside in the vegetable garden is so wet now - that the very short days just don't give it any chance to dry up at all. There's nothing you can usefully do so you're better staying off soil to avoid damaging it's structure. You can keep busy just tidying up, building compost heaps, sorting pots and maintaining tools. Don't worry - there will be more that enough proper gardening to be done again soon! For now we can read seed catalogues, good books and just dream. I always think that gardening is a lot about looking forward and dreaming of the next year's plans too - and that's so important! Whether it's vegetables, flowers, trees or neatly clipped box you most dream about - they're all beautiful dreams! It's the winter solstice very soon - all around me I can already see early spring flowers like hellebores and primroses in bud and gearing up for next year too! Even the early daffodils are poking their noses above ground. Spring is only just around the corner! Nature's eternal optimism never fails to lift the gardener's spirits. It's really exciting when the seed catalogues start dropping through the letterbox again too, with lots of tempting new varieties, and often these days a few more good old ones that are being re-introduced after years of not being available. There's nothing like a bit of 'HRT' to cheer up a cold day! - Horticultural Retail Therapy that is! Much more entertaining than watching endless recycled stupid Christmas films! Seeds are terrific value! Where else in life can you buy so much hope for the future, a real sense of achievement, good health, pure enjoyment and countless delicious meals for less than the price of a Lottery ticket - with far more reliable returns?! No matter how cold it is - when I'm looking at all those colourful seed catalogues - spring seems only just around the corner, the eternal gardener's optimism returns and everything is possible! Despite the awful weather right now - it's hard to keep a gardener's optimism down! We gardeners are always hopeful and optimistic folk - how can we be anything else! We know that the summer will come - we hope for some sun and that the gentle rain will fall. We know that despite the many "slings and arrows" of climate change, we will all still enjoy at least some delicious harvests again next year - an age old certainty. "Blow, blow, thou winter wind...." Shakespeare wrote - he must have been a gardener - as he deeply appreciated and wrote so eloquently about all the seasons. Back in those days people really understood the true meaning of living by the seasons - they had no choice! And they at least could be sure that the seasons would follow their same predictable pattern every year. These days sadly we can no longer rely on that age old assumption. They also had far more respect for Nature than many in our modern, 'so called' more 'enlightened'(?) society. Man has been disrespectful of Nature - ungrateful and wasteful of her riches so abundantly provided. We have abused Nature to the point where we can no longer rely on her generosity. In our stupidity and arrogance we've destroyed so much of incalculable value. Albert Einstein said that "only two things are infinite - the universe and human stupidity".......I so hope that he was wrong and that people will learn to value soil before it is too late..
Don't forget to have tunnel-tape at the ready! This is something I forgot to put at the end of the polytunnel diary for this month. If you have polytunnels - make sure you have a roll of tunnel tape ready for mending it if the worst happens! I'm always worried about flying branches with polytunnels - and I almost hold my breath until the wind stops!! I've had a lot of sleepless nights over the last couple of months - listening for that unmistakable sound of flapping and ripping polythene - which once you've heard you never forget! It is possible to mend them if they're not too bad but the best thing to do if your tunnel starts to get badly ripped - unless the weather suddenly calms and you get a chance to fix it - is to just take a knife, cut it all the way round and just let it go. That way you may save the frame - and that's the expensive bit. It takes courage - but I know from experience that if you don't get the chance to do that - then the frame can become so badly distorted that it's beyond repair! Given the wild extremes of weather that we seem to be experiencing more and more with climate change - future self-sufficient food production may depend on polytunnels and raised beds in many locations. I certainly couldn't grow crops on the flat here any more. If you have any hens - then make sure you keep them as warm and dry as possible at this time of year. Remember - happy hens are healthy hens - and happy, healthy hens lay more eggs - even through the winter! Take out any droppings every day so that they don't get any respiratory problems which can happen quickly if they're breathing in stale, ammonia-filled air. Also make sure they have fresh shavings or hay in their nest boxes. Don't forget they're in their house for longer when the days are shorter. My system of 'spokes of a wheel' pattern runs which I change around frequently works well despite wet weather. I love to see the girls rush out in the mornings to investigate a new patch! They'll tend to slow up a bit on the egg production now for a few weeks - but in mid Jan. they'll start to get back to normal as long as you've looked after them well. I grow a couple of rows of chard and sugar loaf chicory specifically for them every winter in the tunnel where it's very productive. I give them a bunch of leaves every day as well as any other bits of waste from the garden like outside cabbage leaves etc.- they adore them and clear up every scrap. I think it makes a huge difference to their health - and you can certainly notice it in their eggs too - they have really rich orange yolks. If you have a little space in your tunnel you could even be really kind and give them a winter 'mini-break' by penning them in there for a couple of weeks if you have a suitable small house for them - mine always love the warmth and dryness in the polytunnel and have a fabulous time dust bathing in the dry soil! The only problem then could be keeping away the foxes which may try to eat through the side of the tunnel trying to get at them - something which actually happened to me many years ago, when rearing broilers in a polytunnel! I'm currently rearing chicks in one of my polytunnels - and they are very well-protected inside two interlinking, super-size, metal dog cages covered with two layers of small mesh chicken wire. I'm hoping that not even a mouse will be able to get through that to steal food! Make sure you have plenty of layers pellets in for them as many farm shops close for several days over the Christmas and New Year holidays - because even if shops are open - they may run out of stuff. (Remember that organic layers pellets and animal feeds are the ONLY ones that can now be guaranteed not to contain GM soya, or Glyphosate-treated grains, because 'so called free-range' hens are fed on exactly the same feed as battery/cage hens!). By the way - I wouldn't advise feeding red cabbage or sprouts to hens - I did that years ago when I was producing organic eggs commercially and a couple of weeks later many of my egg customers complained that I must be feeding the hens on 'chemical feed' all of a sudden - as the eggs tasted really sulphurous and horrible! That was clearly caused by the sulforaphane in them - which really shows you that what the hens eat really does affect the quality of the eggs they lay - and that anything in the feed, good or bad, is passed directly on to you! It's just the same with other animals - just as we are what we eat - we are also what they eat, if we ear them! That's one of the reasons I would never feed anything other than organic feed to my hens - I don't want GMO maize and soya, or Glyphosate-treated grain in my boiled eggs! The eve of the winter solstice is when I celebrate my New Year's Eve - usually with a few fellow gardener friends, talking about gardening (what else? ), with a glass or two of wine and nibbling a bit of good cheese, perhaps making a little music and having a bit of 'craic'. It's what I like to think of as the 'Gardener's New Year's eve! A time when we look back over the closing year and are just on the very brink of the next. Thank you so much to all the people who have taken the time to write and thank me for my work, or thanked me on Twitter. I really enjoy sharing my original ideas and 40 years experience of growing and cooking my own organic food with you. It's most satisfying and naturally also very complimentary if others find "inspiration" in my work. But if you do happen to copy it, or repeat it in any way online - I would appreciate it very much if you would mention that it originally came from me. Thank you.